Mods: This thread is quite informative (even more so when they solve it). In particular this post by LikeMagic about Firewall Ports. I think it should be considered for Sticky. Sticky on how to remove the MJ software from your computer and how to format the MJ if it is needed due to it not working with a blue light still on! Posted: Thu May 29, 2008 1:56 pm Post subject: maybe a non-technical sticky thread? Sorry if I may seem out of line, as a newbie offering suggestions, but I think a good thread to be stickied might be something like "Before you buy MagicJack, read this" -- and the thread could contain some of the most common concerns new MJ users have raised. There's certainly no requirement that a forum user be an actual MJ customer, and I think it's reasonable to assume that people who are thinking about buying one but doing a little research first might come across this site. Or maybe call it, "FAQ -- Non-technical issues" (from what I can see, all of the presently sticky threads pertain to technical stuff). Here's one entry that it looks to me should go in such a thread; this seems to come up often enough that it might save some potential customers a little grief. Q: The MagicJack site said they wouldn't bill my credit card for 30 days. I ordered the product, and they broke their promise and billed me immediately! 1) Did you order expedited shipping? If you did ... well, they didn't break their promise. There's a notice in the signup process that if you choose expedited shipping, you will be billed immediately. Sometimes people miss it, I guess, but it's there. Sorry. The signup page says I need to put a sig here. Less sticky is more sticky. There are way too many stickies in the tips and hacks forum. WIN_55,212-2 My new best friend on the recreational playground. It's a gas! How about this one for sticky http://www.phoneservicesupport.com/easy-way-to-use-magicjack-without-usb-dongle-t2640.html? Posted: Sat Jan 17, 2009 2:02 am Post subject: Re: maybe a non-technical sticky thread? We've been trying to run some test orders there in our support room, we tried to use a visa-basically a debit card. After entering the information, we checked the box saying This a Debit card, a pop message will say "Due to the nature of the Free Trial Offer, this Free Trial is only available for Credit Card users. If you use a Debit Card, your Card will be charged right away, but you will still receive our 30-Day no-questions asked - Money Back Guarantee". The above message doesn't show when using a credit card. I think we should read first before we proceed. Considering that Magicjack is a business, the owner wants to make things clear- a "Disclaimer" notice to be exact. Posted: Sat Jan 17, 2009 6:00 am Post subject: Re: maybe a non-technical sticky thread? "For all of those who want to spoof, or manipulate, the caller ID on outbound calls to play jokes on their friends....know this....there was a time when it was possible. However, it is not possible anymore. MagicJack caught on to what was going on and found a way to fix the problem. However, please leave satisfied knowing that your phone bill is only 20$/year. Have a nice day"
This is an example of why I believe this forum needs a wiki to distill common topics into easy-to-find (and update) knowledge units. Discussions just aren't wasy to find (no table of contents), nor update (you have to read to the last reply). Discussions are good for sparking innovation, finding what are common subjects of interest. But, not finding definitive (encyclopedic or topical) references. 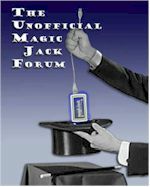 See the MagicJack Wiki (FAQ, How-To, history and more). While I tend to believe that the forum yields a better picture of a topic, since it is rather difficult to retain dissenting opinions on a wiki, I don't believe this is the problem at hand. Mark, I understand and agree with your position on the usefulness of the wiki, but the wiki environment shares a characteristic with the forum environment in this case. That is, "You can lead a horse to water, but you cannot make him drink." Just as many of my postings admonish people to Search for the answer, many of yours admonish people to look to the wiki for the answer. Sadly, too often we are preaching to an audience who cares to put forth no effort in satisfying their own needs, but wish to be spoon fed. I salute damion_dark8 for having been responsible enough to honor forum etiquette by reading before posting. By using the word reading instead of the word searching I believe that he spent his 2 hours absorbing more than just this one topic he commented upon. I also believe that he commented on this one topic when he realized he had the entire story and then continued to read into the treasure that is this forum. It is not difficult to perform a Search, and it is even simpler to read. Unfortunately, reading is too difficult for many people, and they choose to begin their membership here by asking a frequently asked question instead of looking. By definition, a forum is a place of public discussion. Too many people forget their responsibility in this equation, confusing a forum with a Customer Service center, and begin their relationship with the forum from a "gimme" stance. That is, "You can lead a horse to water, but you cannot make him drink." Just as many of my postings admonish people to Search for the answer, many of yours admonish people to look to the wiki for the answer. Sadly, too often we are preaching to an audience who cares to put forth no effort in satisfying their own needs, but wish to be spoon fed. The typographical convention known as books was invented (with indexes, tables of contents, etc.) because it was easier for individuals to find information themselves instead of going to the village reciter of history (or the priest). The fact that some people still wouldn't read doesn't negate the common-sense fact that empowerment (and the tools to make it easier) yields greater knowledge through self-service. We wouldn't have wikipedia today if it were true that people wouldn't bother searching out information no matter how easy you make it. I'd also like to add that the "horse to water" analogy cuts two ways. It's easy to engage in discussions, and then tell newcomers "go look for previous discussions". IMO, that's the same kind of laziness ascribed to newcomers who don't want to wade through endless streams of consciousness. But, I do agree with you that a wiki isn't a replacement for a forum. Discussions foster the creation of knowledge. They just aren't the best form of knowledge for easy location, modification, and cross-referencing to related knowledge. I salute anyone who spends two hours searching for nothing more than "caller ID blocking is not available," or spends that much time reading a how-to thread only to get to the 250th post saying "it stopped working."